Please read our reviews and find out what people like you have to say about our services and prices. “We recently engaged the services of Tom Kearns to solve a number of serious electrical faults and sort out underfloor heating at our home. 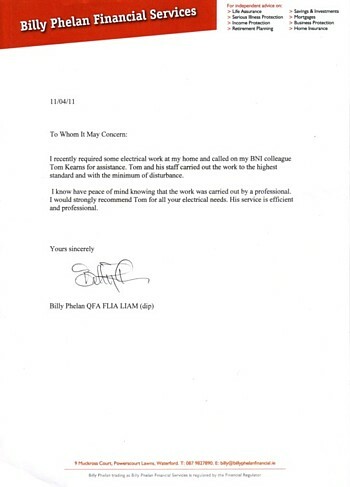 We were very impressed with the care and service provided by Tom and his assistant Ian. They turned up at the agreed times and if there was a change in plan Tom called us in advance to advise us. Tom Ably got to the root of the problems that had plagued us for a number of years. The work was to a high standard and Tom explained clearly what he thought was causing the problems and then sorted them. 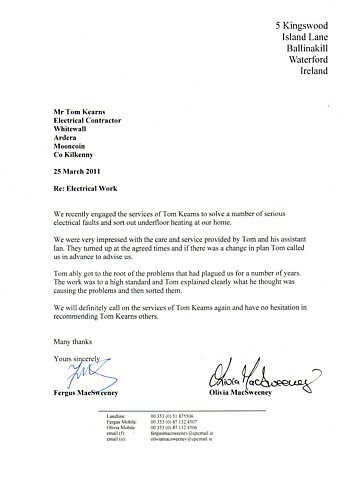 “I recently engaged Tom Kearns Electrical. I had a requirement for additional powerpoints at my new base in Ferrybank. Tom did a great job installing the required points and performed a full test on completion. The installation was neat and tidy and caused minimal disruption. Prior to this Tom had installed an electricity meter, and checked internal and external lighting for the building owner, who was also very pleased with Toms work. 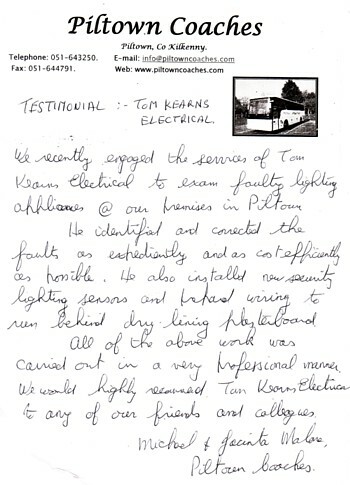 “We recently engaged the services of Tom Kearns Electrical to examine faulty lighting appliances at our premises in Piltown. He identified and corrected the faults as expediently and as cost efficiently as possible. He also installed new security lighting sensors and laid wiring behind dry lining plasteboard. All of the above work was carried out in a very professional manner. 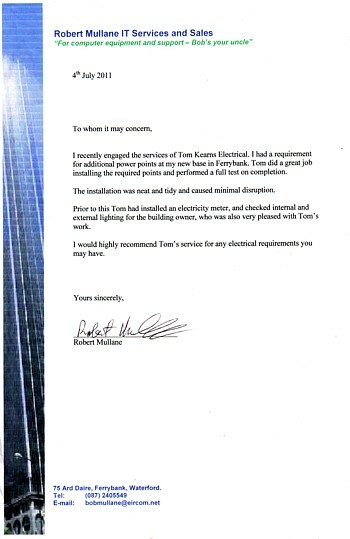 “I recently required some electrical work at my home and called on my BNI colleague Tom Kearns for assistance. Tom and his staff carried out the work to the highest standard and with the minimum of disturbance. I now have peace of mind knowing that the work was carried out by a professional.